Why? One of the smallest, most dangerous and most irritating words in the English language, I find, it signals curiosity - no, more than that, it signals questioning. It signals not taking things at face value. It signals not wanting to accept things just because you've been told that's the way they are. It signals the desire to find out. And for that reason I'm coming to love the word "why?" even more than I did when I was a child first learning about things that made up the universe, even though we couldn't see them, and why the sky was blue. It's also a very useful word to use when questioning people's beliefs, and one that tends to reveal a fair bit about the people and beliefs one's questioning. Maybe it's just my misanthropy or the circles I move in, but I tend to find that not very far into the questioning people stop being able to back up the notions they're propounding, instead resorting to circular reasoning, telling me I'm being impolite, or saying that my asking "Why?" is childish. Well, if questioning is childish and impolite, then children and rude people have the right idea. Revealing more about the universe in which we live is something to be lauded, even if it makes people uncomfortable, and I'd argue that a person who tries to do that is more mature than many an unquestioning and ignorant adult. (And I'd back up my assertion, too, if anyone wanted to know why.) 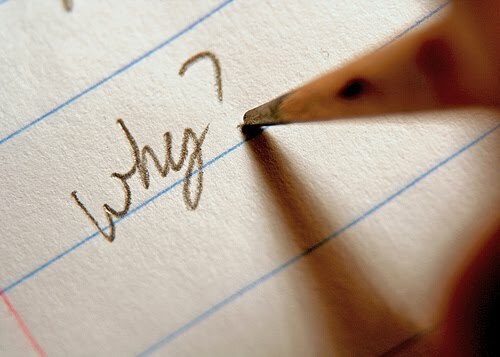 Thinking about questioning, I wish people would ask me "why?" more often; I wish they'd ask me to justify my beliefs, like I ask them to do. Not because I take pleasure in torturing people or in being intellectually tortured, in desperately scrabbling for logical reasons for my beliefs, but because I'd like people to ask me to really think about what I do and how I live, so that I hammer out a logical model of the universe and hopefully become a better person for doing so. Maybe, instead of getting angry when people questioned us and held up a mirror to our own failings, instead of calling them immature or rude when they did ask questions, if we actually encouraged questioning and worked on fixing our flaws, maybe then the world would be a better place. Just maybe it would.